Liquidation, generally, refers to the process of selling off a company’s assets in order to generate revenue. In most cases, the company’s inventory is sold at a large discount in order to maximize the chances that they sell all of their inventory and get the most money possible. More often than not, a company that is going through the liquidation process will close once all of its assets have been sold off. As for the accounting domain, liquidation will involve the selling of a business’s assets in order to pay off the company’s creditors before terminating its operations for good. Here, we will focus primarily on retail liquidation and how hiring a professional liquidator can yield great dividends in both the short and long-term. A professional liquidator can actually save a client before it is too late. Similar to seeing a doctor when symptoms first arise, it is ideal to nip a problem in the bud during the early stages in order to maximize the probability of a healthy prognosis. Hence, working with a professional liquidator will help improve the prospects of success as well as the survival of a business. As such, we recommend that you have a retail liquidator on call to ensure fewer delays and yield better long-term outcomes. It is also possible in some cases to work with a liquidator at no cost on an anonymous basis and with no obligation. So, we highly advise that you perform the necessary due diligence and select the best retail liquidator for your unique retail liquidation needs. 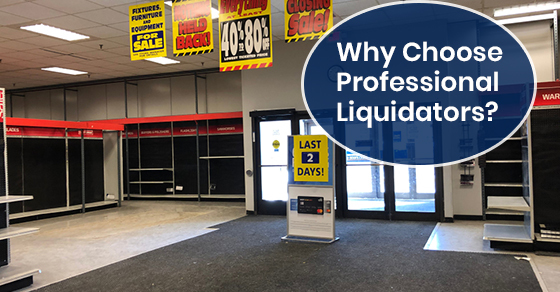 The best retail liquidators have years, if not decades, of experience in dealing with chaotic or stressful situations in a tactful, timely, and reliable manner. In other words, they are experts at taking control of a chaotic situation, making sense of a difficult or ambiguous situation, and quickly help directors make sound business decisions. While a neophyte or nihilist may concoct a doomsday scenario for a business that is on life support, a sharp professional liquidator will devise a pragmatic liquidation strategy in order to buy a business a few more weeks or months to help maximize their probability of success and survival. Many struggling retailers will turn to their accountants in order to obtain financial advice on how to make their payments. However, while their accountants may buy them some time with a seemingly infinite number of ATO payment arrangements, many clients are simply too overwhelmed to implement their accountant’s latest payment plans or simply opt to ignore their sound financial advice. However, when a retailer sits down with a professional liquidator, the retail liquidator will help them understand all of the options available. That is, they will help their clients see all of the different possible scenarios that may result if they continue to follow the same ineffective and counterproductive routines every day. In sum, a professional liquidator will help retailers realize that they need to make deliberate and marked changes and implement said changes by prioritizing them above all other corporate matters. A professional liquidator will provide you with all of the tools and resources that you need to survive, and even thrive, under one roof. From consumer electronics and housewares to apparel, inventory, and textiles, a professional liquidator will help you maximize the value of your stock by devising and implementing business strategies that have been customized to meet the unique needs of your business. From warehouse sales and pop-up outlets to retail reinvention, a professional retail liquidator will have the expertise required to handle and assess every aspect of the process. This will include everything from workers, locations, and landlords, to signing, pricing, and marketing. In other words, only the professionals have the know-how, gumption, and foresight to handle any and all issues that may arise during the liquidation process. For instance, they will be able to deal with the restructuring of a retail chain and help your company liquidate any surplus inventory in order to generate revenue. They can also help your company generate working capital in order to help fund a corporate turnaround, and also dispose of any inventory—necessitated by a bankruptcy filing—in a tactful, timely, and effective manner. In the end, a professional liquidator will never forget the human element of retail liquidation. They will find customized and practical solutions that have the best interests of you and your employees at heart. The end result is that they will implement business solutions that are not only humane, but also proactive in order to maximize your corporate yields. Dynamic, professional, humane, ethical, and always beneficial, liquidation connoisseurs became professionals because they always placed the needs of their discerning clientele above the bottom line and personal gain. If you are looking for a simple, quick, and effective way to liquidate your assets, then we can help. Michael’s Global Trading (MGT) specializes in concise, clear, and timely communication, as well as full transparency throughout every step in the liquidation process. We take great pride in providing our clients with fair offers for their industrial and business assets and strive to go above and beyond the call of duty to ensure that all of their needs are taken care of. MGT is a boutique firm that helps businesses manage their inventory and assets via liquidation and auction sales. Over the years, our clients have included retailers, business owners, government entities, industrial and commercial corporations, financial institutions, and bankruptcy trustees. If you would like to learn more about our superlative client-oriented auction and liquidation services, please visit our website or call us at 888-471-5066 for a free, no obligation quote and consultation.